Hosted by Thurrock Council at Orsett Hall, the Whole Systems Obesity Summit showcased the council’s new approach to challenging increasing obesity trends in Thurrock to over 100 attendees. Those present first listened to a range of speakers including the Director of Public Health, Ian Wake, and Mark Cortnage, who founded Shift the Timber – a physical activity programme for Thurrock residents. Attendees then took part in one of five workshops aimed at preventing obesity. Topics included enabling schools and services to help children and young people achieve a healthy weight; improving food and physical activity environments; increasing positive community influences and improving how to identify and manage obesity. Key partners who attended the event included local school head teachers and staff, GPs and primary care colleagues, Thurrock Council colleagues from health, social care and environment, as well as local services and voluntary and charitable organisations. The Whole Systems Obesity Summit is part of Thurrock Council’s Whole Systems Obesity Strategy, which is due to be published in April 2019 by the council’s Public Health team. It aims to engage multiple sectors to achieve key goals in tackling this local issue. 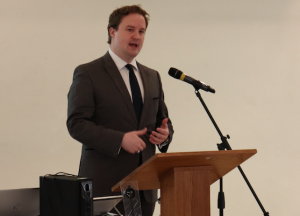 Cllr James Halden, portfolio holder for education and health, said: “Obesity is a real problem throughout Thurrock and can cause significant health issues in both children and adults, ranging from high blood pressure to Type Two diabetes.